Following a thankfully cooler than normal September, it has become the critical climate question of the moment: Is the drought-causing, heat-wielding monster ridge finally history? If current outlooks and history tell us anything, a monster trough may be our next concern. But wait, you may say. A trough is the opposite of a ridge, so a cool trough would be a good thing for Washington's drought, right? Wrong. As with a home, location is everything in meteorology. Let's begin with an analysis of the reasoning behind why a persistent, "monster" trough may materialize this winter. Later, we will discuss the potential impacts of such a pattern. An upper air trough off of the west coast has been a recent feature of the global atmospheric circulation pattern, as shown below. Figure 1 shows the state of the atmosphere (500 mb heights, 18 to 19 thousand feet above the ground) on October 8. A trough (low atmospheric heights) is centered south of Alaska near the 528 line. A trough is generally forecast by models to potentially be a major player during the upcoming cold season (see below). Figure 2 shows the forecast circulation pattern (700 mb heights; about 10 thousand feet above the ground) from the CFSv2 model for the upcoming winter season (December 2015 to February 2016). The blue area west of Washington is a prediction of negative height anomalies, which can also be thought of as a mean trough in that region. 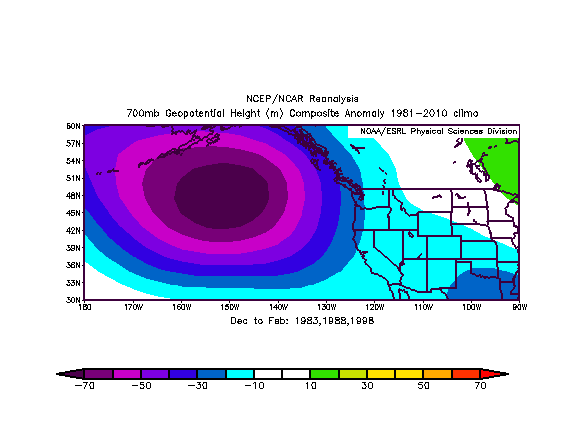 History also suggests that the 700 mb heights tend to be below normal (purple color) over the Gulf of Alaska (North Pacific Ocean) during analog years (Figure 3). For the 2016 winter (December 2015 to February 2016), I chose 1983, 1988, and 1998 as analogs for this composite since each of those winters featured both a strong El Niño and a robust and positive PDO (Pacific Decadal Oscillation). It is interesting that these two very different methods (dynamical forecast vs statistical analog composite) produce qualitatively similar results, as both seem to suggest a trough in the Gulf of Alaska. So what is the problem? Unfortunately, a trough in that location can be an issue for Washington, especially during the winter. If a healthy snowpack and legitimate drought relief is desired, this is not a beneficial setup. The flow on the east side of a trough tends to be from the south (a warm source region) more often than normal. Furthermore, such locations are often associated with more unsettled conditions than is typical near ridges, which potentially means more moisture and wind. Therefore, this pattern often causes warmer than normal conditions in the winter due to increased mixing and a lack of inversions (wind), as well as an inability for the land to effectively radiate heat due to the latent heat of water vapor (clouds and moisture). Thus, even if the air aloft (higher in the atmosphere) this winter is no longer much warmer than normal (as it had been through August 2015), the increased southerly flow may nonetheless cause above normal surface temperatures and diminished snowpack in Washington. Stated another way, even if there are wet periods this winter, the precipitation will more likely be in the form of somewhat welcome rainfall, rather than very welcome snowfall. The bottom line is that a potential transition from a monster ridge to a nearby monster trough may not be very helpful after all. For the coming winter, a split flow regime may arise periodically. Storms that affect us could be weak in nature, and fewer than normal. There will no doubt be week to week variability, but overall, the pattern probably won't be ideal for a strong recovery. While the spring 2016 snowpack is statistically unlikely to be as low as last year, given the current indications, we may not be out of the woods just yet in terms of drought. Just in time for the lead up to Halloween, the evidence suggests that we may be replacing one weather monster with another. Note: It is important to also keep in mind that I am mainly describing a trough in this context as below normal heights, rather than lower actual heights. While there is a distinction between the two definitions, for the purposes of this discussion, it is acceptable to use the term in both contexts. After a summer of record heat and dryness, a potent late August storm ushered in a major pattern change. The ensuing unsettled conditions led to our state's first below normal temperature month since last November. At least some rainfall was also received across much of the state in September, although central areas generally recorded very light totals. However, the 0.66 inches that fell in Pullman on September 5th was their largest daily total since February 9th. 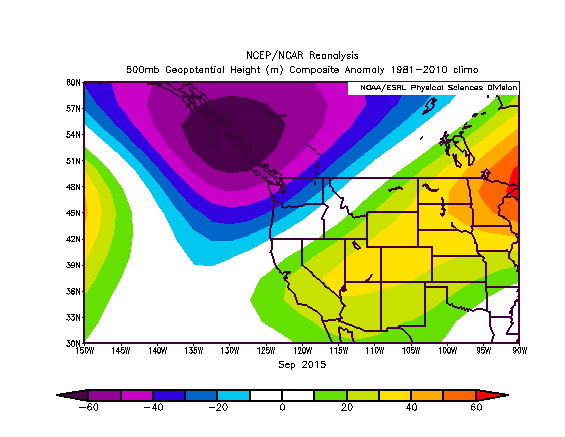 Figure 4 is a 500mb height anomaly pattern for September. The purple to the northwest of Washington indicates an anomalous trough, which was responsible for the relatively cool conditions. There is quite a difference from previous months, and especially from June, which featured the monster ridge at near- peak strength (Figure 5). The cool September was the most helpful weather month in a long time for Washington, although it probably does not mark the end of abnormal warmth in Washington, even if the monster ridge is essentially gone. 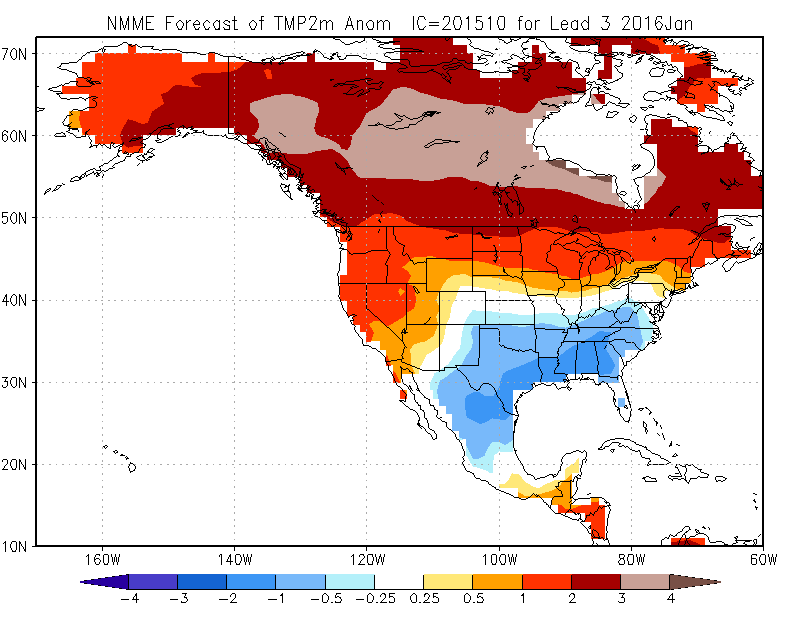 Figures 6 and 7 below are forecasts for mid-winter (January 2016) from the National Multi-Model Ensemble (NMME), which is a compilation of many different runs of numerous forecast models to develop an average forecast. Although only January is shown, these images are fairly representative of the overall winter forecast. 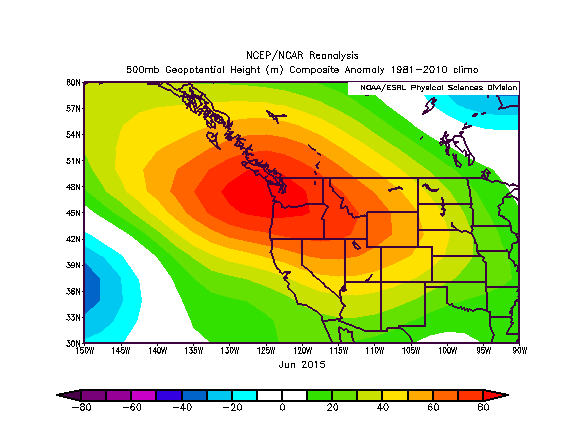 The red colors over Washington show that warm and dry conditions are favored. Obviously, the forecast of unusual warmth and low mountain snowpack carries a high degree of confidence, while the precipitation outlook is more uncertain. 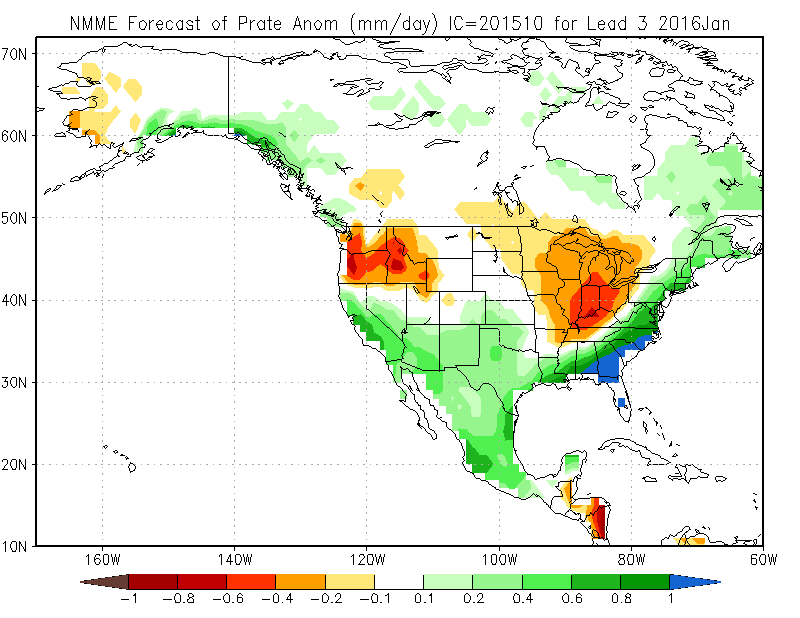 Slightly below normal precipitation seems to be a reasonable outlook for Washington. Some dynamical models are suggesting dry winter conditions, while others indicate near or even slightly above normal precipitation. History also provides a mixed signal, as strong El Niño years provide some slight hope for wet conditions given their large event-to-event variability, while robust positive PDO years diminish those hopes. From an atmospheric circulation perspective, the anomalous trough seems to be closer to Washington (slightly wetter) during strong El Niño events, and farther west in the Pacific Ocean (drier) during strongly positive PDO years, and so this winter's outlook is somewhat of a compromise.